Following sold-out inaugural events at Pismo’s Beach’s 2014 Bubblyfest by the Sea and the Pop-Up BubblyFest in San Francisco last April, organizers are gearing up for a sell-out year two from Oct. 2 through 4 in the seaside town of Pismo Beach. 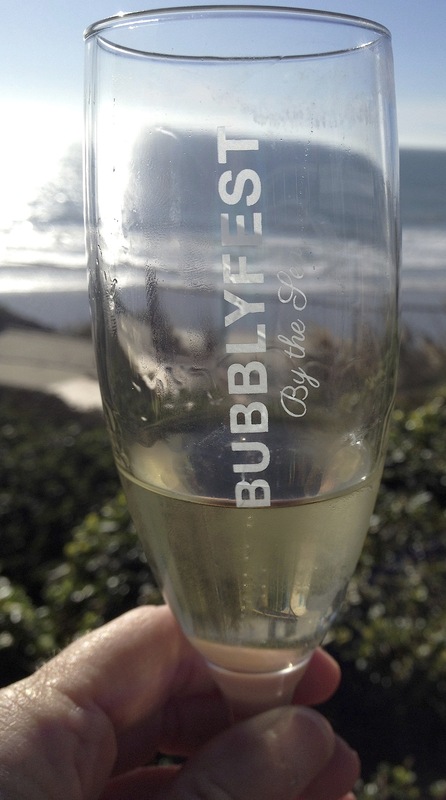 “Bubblyfest by the Sea is an upscale, educational, dedicated sparkling wine and Champagne event, with a touch of humor thrown in,” said Holly Holliday, event producer. Bubblyfest will return to the ocean front SeaCrest Hotel, located at 2241 Price St. Ticket sales opened in February, and while VIP tickets were snapped up within a week, a few remain available for the Grand Tasting Saturday, as well as Friday’s excursion, dinner, seminars and cocktail party, Holliday told me today. Visit http://www.bubblyfest.com/schedule-of-events/ for details on each event from Friday through Saturday. All bubbly, all the time. Organizers expect the weekend event to be another sell-out. New this year is the Sparkling Wine “Excursionar,” a chauffeured field trip to Laetitia Vineyard & Winery, a local specialist in sparkling wines. Attendees will enjoy an extremely rare tour of the famed production facility, and will taste through and learn about the nuances of all seven of Laetitia’s sparklers with winemaker Dave Hickey in the vineyard during the winery’s harvest activities. David Glancy, Friday’s seminar facilitator, is the founder and chief education officer of the San Francisco Wine School, and one of just 12 people in the world to pass both the Court of Master Sommeliers’ Master Exam (MS) and the Society of Wine Educators’ Certified Wine Educator exam (CWE). The San Francisco Wine School offers professional wine studies, among them the French Wine Scholar (FWS), Society of Wine Educators’ programs (SWE) and the California Wine Appellation Specialist (CWAS). Glancy also heads SFsommelier Consulting and sits on the editorial advisory board of Sommelier Journal. Glancy will “lead” participants to the Champagne region for an educational tasting on the history of Champagne and the new age of California Sparkling wines, Holliday said. The winemaking panelists are Clarissa Nagy of Riverbench Vineyard & Winery, Tyler Elwell of Halcyon Wines and Norm Yost of Flying Goat Cellars. They will discuss vintages, growing conditions, terroir and winemaking styles between the “Old Guard” and “New Guard,” Holliday said. July’s Wine Calendar: The Garagiste Festival: “Urban Exposure” in L.A.
What’s a Garagiste? (gar-uh-zhe-stuh) is a term originally used in the Bordeaux region of France to slight renegade small-lot wine makers, sometimes working in their “garages” (anything considered not a chateau), who refused to follow the “rules,” and is now a full-fledged movement responsible for making some of the best wine in the world. Founded in Paso Robles in 2011, the Garagiste Festival: Urban Exposure debuts at Union Station and will benefit Mending Kids International and the Cal Poly Wine and Viticulture Program. My first Garagiste Festival was the organizers’ premiere event, held in November 2011 outside Paso Robles inside a show barn at Windfall Ranch. Calling the venue a “barn” doesn’t do it justice, for Windfall Farms is a 724-acre equestrian facility, and the barn was brick with glass and copper steeples. Winemakers set up tables inside the stalls, most of which were bigger than my living room. Same idea, in different locales: The Paso Robles, Solvang and now Los Angeles Garagiste Festivals focus on tiny (and often, undiscovered) artisan winemakers who produce as few as a couple hundred cases each year. Many of the Los Angeles-based winemakers participating in “Urban Exposure” still work day jobs, but like their colleagues in Santa Barbara and San Luis Obispo counties, follow their passion for wine. According to Webb, among the Garagistes are the team who work together in film production and have received raves for their winemaking; a couple whose wine is rooted in their Indian heritage and inspired by the 64 arts of KamaSutra; an Orange County mortgage broker; a winemaker inspired by his grandfather, who made wine in his Ontario basement; and a brewer and lab manager at Golden Road Brewing. And my favorite: The Culver City sound engineer who secretly planted his first vines at Culver City’s MaryCrest Manor (a nursing home managed by Carmelite nuns), and had to answer to the police for his efforts. After all, one doesn’t have to own a vineyard, winery, cellar or tasting room to make good wine. The event takes place from 2 to 5 p.m. at Union Station. Wood & Vine will provide cheese and charcuterie. Among the winemakers already scheduled to pour are: Alma Fria Winery, Alma Sol Winery, Alta Colina Vineyards, Archium Cellars, Ascension Cellars, Autonom, Blue Cape Cellars, Bon Niche Cellars, Bratcher Winery, Carucci Wines, Center of Effort, Cholame Vineyards, Cloak & Dagger Wines, Cutruzzola Vineyards, De Su Propia Cosecha, Dilecta Wines, Dubost Ranch, DV8 Cellars, Graef Wines, Kessler-Haak Vineyards, La Fenetre Wines, Levo Wines, Luminesce, LXV Wines, Marin’s Vineyard, MCV Wines, Montemar Wines, Native9, ONX Wines, Pulchella Winery, Rendarrio Wines, Seven Angels Cellars, Shai Cellars, Singer Cellars, Soaring Hawk Vineyards, The Farm Winery, Turiya Wines, Two Shepherds Winery, Vinemark Cellars, Vines on the Marycrest, Vino V Wines, Weatherborne and Workman/Ayer. The Unified Symposium, one of North America’s largest trade and wine industry seminars, returns Jan. 29 through 31 at the Sacramento Convention Center. Beginning in 1995, two wine industry organizations, the American Society for Enology and Viticulture (ASEV) and the California Association of Wine Grape Growers (CAWG), joined efforts to present Unified in order to highlight issues and trends in the wine industry. Wine Business Monthly and its online version, winebusiness.com, are major sponsors. While online registration closes Jan. 22, attendees can still register onsite during the event itself, organizers emphasized. The trade show portion of Unified opens at 9 a.m. Wednesday and continues until 6 p.m., and again from 9 a.m. to 4 p.m. Thursday. Mid-way through Thursday’s Santa Barbara County Planning and Development Department’s third public hearing to gather input for revisions to the Winery Ordinance, one participant raised a point that momentarily silenced the crowd. “Why don’t we consider pulling special events out of the (proposed) winery ordinance and include them in a county-wide ruling” that is not specific to wineries?” asked Michael Dobrotin. Many in the standing-room-only audience murmured or nodded in agreement with Dobrotin, who is involved in a vineyard project outside of Buellton. Facilitating the two-hour hearing was Susan Klein-Rothschild, and in attendance were Dr. Glenn Russell, Planning Department director, as well as Deputy Director Jeff Hunt, Assistant Director Dianne Black and Stephanie Stark, agricultural planner. Thursday’s hearing, the third of five scheduled during which county planners hope to gather public feedback on the ordinance before it heads to the County Board of Supervisors for revision, was devoted to Special Events, and drew approximately 65 participants. The planning staff encourages those interested in participating in the input process to attend a hearing and speak, fill out a comment card at a meeting, or comment via the department’s web site. Comments emailed must be received within two weeks following each meeting date — by Jan. 24 in the case of the Jan. 10 meeting. 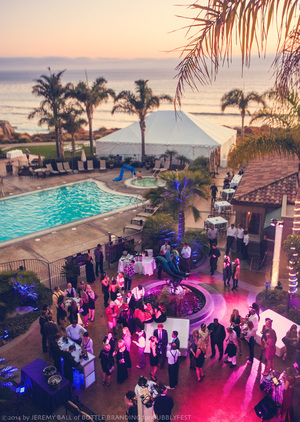 The planners define special events, Stark explained, as those lasting less than one day, with 80 or more people in attendance on winery/vineyard property, having concerts with or without amplified sound, and include weddings, advertised events, fund raising events and winemaker dinners open to the general public. Clearly defined in the existing Winery Ordinance, created in 2004, are three tiers of “maximums” that limit wineries’ events. A Tier 1 Winery is limited to four special events per year, and each event must not exceed 150 people. Tier 2 wineries can have eight events and 150 people at each, and Tier 3 wineries 12 events per year, and 200 people at each. In order to host any kind of special event, a winery/vineyard site must be at least 20 acres in size, Black said. Attendees Thursday spoke up either in support of rural wineries’ attempts to hold special events — especially fundraisers — or complained that the ensuing noise, lights, traffic, dust and parking make their neighborhoods unbearable. Phil Bond, who said his Santa Ynez Valley home of 20-plus years is located five miles from Gainey Vineyard, described hearing “significant” noise whenever the winery hosts an event. “Sound travels, especially at night,” he said. He and other opponents present emphasized to the planners that it was the “cumulative” effect of several events throughout the years, not isolated concerts, weddings or benefit dinners, that have urging stricter rules. In the hour-plus leading up to Dobrotin’s comment, representatives of local nonprofit groups that have benefitted from special events spoke in favor of allowing winemakers and wineries to extend community goodwill by, well, throwing a party or two. Bruce Porter, board chairman of the Santa Barbara County chapter of the American Red Cross, told the planning staff that “it’s so important that we have access to wineries because they are our theaters” when it comes to events. Many wineries throughout Santa Barbara County need special events to boost sales, said Kady Fleckenstein, executive director of the Santa Ynez Valley Visitors Association. Smaller wineries and winemakers often cannot afford to utilize brokers and wholesalers to sell wine, and so rely on “direct-to-consumer sales out of necessity,” she said. “There’s so much competition in the industry, and wineries need that connection to consumers” that special events offer. Lisa Bodrogi, newly appointed executive director of the Central Coast Wine Growers Association, threw her support behind wineries’ events because, in turn, those parties benefit florists, caterers, graphic artists, wedding staff, lighting companies and more. “As an industry, we bring business to Santa Barbara County,” she said. As the hearing entered its second hour and Klein-Rothschild pushed to keep speakers to the agenda, some in attendance grew slightly impatient, but the overall tone remained congenial. When former county supervisor and longtime cattle rancher Willy Chamberlin urged the planning staff to not regulate events “simply because they exist,” the pressure in the room eased slightly. “Negative impacts (of events) must be shown to exist,” Chamberlin emphasized, and several others agreed. Representing the Santa Barbara County Cattlemen’s Association, Chamberlin stood to hand to the planners a copy of a “white paper” drafted by the association and its attorneys. A white paper is typically used to help better define rules, organization and authority. It was Chamberlin’s presentation that appeared to trigger Dobrotin’s suggestion to pull “special events” out of the revision to the Winery Ordinance and into documentation better suited to businesses at large. The next public meeting about the ordinance is from 6 to 8 p.m. Monday, Feb. 11, in Stacy Hall at St. Mark’s-in-the-Valley Church in Los Olivos. The topic: Neighborhood Compatability. One of the newest businesses to open in Los Olivos has only a slight link to wine — one of its owner/operators is winemaker Michael Larner. But the driving force behind the Los Olivos General Store is co-owner Christina LoCascio Larner, Michael’s wife and a longtime local artist. The Larner family opened their store in mid-May in the historic garage and pumping station at the corner of Grand and Alamo Pintado. The structure, built in 1901, housed the first gas station in Santa Barbara County, the couple noted. The named their Los Olivos General Store after the “small town with a strong sense of community,” Christina Larner said. “We decided to recreate an old-time general or neighborhood store — but with a modern twist. The goal was to create a place where locals and visitors alike could shop for a broad range of unique gifts and locally produced products.” The store’s theme is trifold: wine, food and home. She displays a few of her originals and limited-edition prints in a tiny studio off the main store, and said she plans to have a wine art exhibit there in the future. Christina Larner graduated with a fine arts degree from UCSB, and attended programs at the Laguna College of Art and Design, as well as Otis College of Art in Los Angeles. In 2002, she started her wine industry career and discovered the intrigue of using wine as a palette. Her paintings showcase wine in the form of vineyards, grape clusters and portraits. Since 2003, Larner has collaborated with Artiste Winery, also in Los Olivos, for in solo exhibits and more than nine wine labels featuring her art. Along with local painters’ and photographers’ pieces, Los Olivos General Store offers repurposed furnishings and decor, including pieces crafted from wine barrel staves, such as candle holders, baskets and Lazy Susans, and vintage goods such as 1930s Depression glass, blue mason jars and old soda crates. Local food items include honey, olives, olive oil and chocolate, as well as lavender products from Clairmont Farms and lotions and soaps from the Grapeseed Company of Santa Barbara. 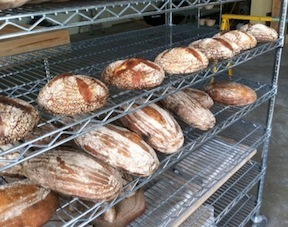 New Vineland Bread photo/Freshly baked loaves of bread line shelves inside the bakery, located in Lompoc's Wine Ghetto. New Vineland Bread, located in the Lompoc Wine Ghetto, will next week launch its long-anticipated bread subscription with a 12-week session. Beginning June 6, fresh loaves of bread will be available to members who join the June-through-August session, said Melissa Sorongon, co-owner of New Vineland Bread with her husband, New Vineland/Piedrassasi winemaker Sashi Moorman and Peter and Amy Pastan of Washington, D.C.
Moorman also is consulting winemaker for Evening Land Vineyards, Sandhi Wines and Stolpman Vineyards. Peter Pastan is chef and owner of Two Amys Pizzeria and Obelisk, both in Washington, D.C., and Amy Pastan is a longtime writer, editor and book producer. The New Vineland Bread subscription will operate like a Community-Supported Agriculture (CSA) program: participants will pay to “join” for at least one session and receive a set number of loaves each week. The owners are limiting membership to the first 50 who join, Sorongon explained, but will create a waiting list for latecomers, or those who wish to retrieve the breads from a different location, such as the Santa Ynez Valley or Santa Barbara. Members active in the summer session get first dibs on continuing with the fall session before it is opened to those on the waiting list, she noted. The breads available each week will be the choice of baker Kate Heller, “so folks won’t know what they get until they come to the bakery,” Sorongon said. Heller’s efforts currently include the Durum, Franciscan (whole wheat), Fifty-Fifty (spelt and fresh-milled wheat) and Walnut (with vin santo) loaves, Sorongon said. New Vineland recently began selling bread and olive oil at the Ojai Farmers Market (Sundays), and once the company harvests its first locally-grown wheat early this fall, it will also participate in Santa Barbara County Farmers Markets, she said. Subscription information: Choices: Family (small) two loaves, one small and one large, for $145 per session, or Family (large), two large loaves, for $180. No bread service Wednesday, July 4. Member pickup will be Wednesdays between 4 and 6 p.m. at the New Vineland/Piedrasassi winery/tasting room/bakery, 1501 E. Chestnut Ave., at the western edge of the Lompoc Ghetto. Information: http://www.newvineland.com, or info@newvineland.com, (805) 736-6784. The first Buellton Brew Fest, which launched the Santa Ynez Valley’s “Craft Beer Week” on Saturday, May 12, at River Park, was a sell-out hit, organizers said. The one-day Brew Fest sold 1,000 tickets, said Holly Todd, director of the Buellton Beer Fest, who described the festival as one that “not only showcased some of the best craft brews in the state, but the amazing beers provided locally. We are already looking forward to May 2013,” next year’s event, she said. The Buellton Beer Fest included 22 breweries, among them local brewers Figueroa Mountain, Firestone, Solvang Brewing and Tap It. Others from the region, and California, were San Diego’s Stone Brewing Company, Mendocino Brewing Company, Blue Moon, Island Brewing Company, Sam Adams and many more. Buellton-based Avant Tapas & Wine Bar provided lunch to all attendees, while the Chef’s Touch of Solvang provided free samples of its beer chili, and Doc Bernstein’s was on hand with a Guinness ice cream, Todd noted.